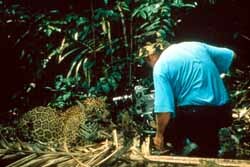 "Journey into Amazonia" features the swollen rivers, flooded forests and dense canopy of the vast rain forest recognized as one of Earth's natural wonders. For three years, producer Harry Marshall and his team braved sweltering heat and insect swarms to capture the changing seasons of a magical world. This three-hour wildlife series offers an enchanting look at rarely-seen creatures as they contend with the volatile waters of the world's largest river system. The river's rich, roiling waters sustain a vast cast of characters, including seven-foot otters, fruit-harvesting fish, fresh water dolphins and manatees. On land, stealthy jaguars prowl, acrobatic monkeys defy gravity, and keen-eyed harpy eagles soar. "Waterworlds" features the churning waters of the world's mightiest river, the force that creates, destroys and shapes Amazonia. The boto dolphin and the giant otter, respective inhabitants of lagoons and flooded forests, are among the key characters of this first episode. In this world, the Amazon rushes, then recedes, as the rainforest's terrestrial and aquatic realms battle for dominance. "The Land Reborn" reveals a new world teeming with predators. Stealthy jaguars prowl, army ants swarm and tarantulas bring down rodent prey as two and a half million square miles of rain forest emerge from the floods. "The Big Top" is the luxuriant mantle of the world's greatest rainforest, which is home to nearly half the world's species. Here, harpy eagles carry off full-grown monkeys and algae-covered tree sloths live upside down. Life and death dramas unfold in this most precarious of habitats, more than 100 feet above the forest floor.